The New Ludgate scheme consists of two buildings nestled between St Paul’s Cathedral and Ludgate Circus. It has won the Royal Institute of Chartered Surveyors (RICS) top prize for Commercial Office Building of the Year 2016 and the City of London Building of the Year Award and is shortlisted for the NLA Office Building of the Year Award. Two New Ludgate is a £260 million development by Land Securities, the UK’s largest commercial property developer. It provides 193,000 sq ft of Grade A office accommodation and 7,500 sq ft of prime retail space. Two architectural firms were involved Sauerbruch Hutton designed the building and Fletcher Priest designed One New Ludgate and oversaw the scheme. 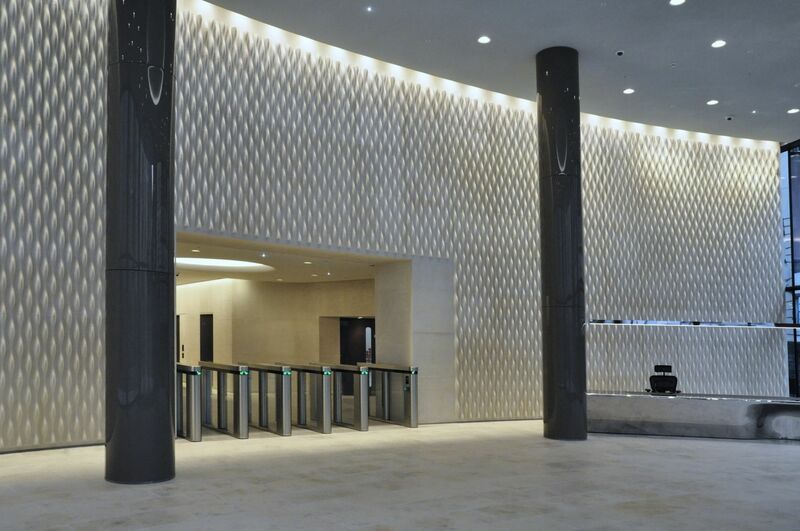 The main reception for Two New Ludgate has a feature wall in Portland Stone. The curved wall is 8m high and 30m in length. Putney & Wood, the stone contractor’s in-house designers used CAD to detail every stone before creating a visual representation of each elevation. A 3D model was then created as a final check before production. stoneCIRCLE was one of 3 firms involved in manufacturing the frieze and they used the latest CNC processing machinery alongside 3D modelling to ensure pinpoint accuracy. The stones had to be sanded by hand after manufacture to remove machining marks. Once on site, Putney & Wood’s installation team aligned each textured panel before mechanically fixing them. This was further complicated because the joints flowed with the vertical curvature formation of carved stone panels, while maintaining a consistent 3mm width. The result is a stunning, homogenous effect which has to be seen to be fully appreciated.